Dr Nkosinathi Shongwe with his proud mum at the Graduation ceremony. 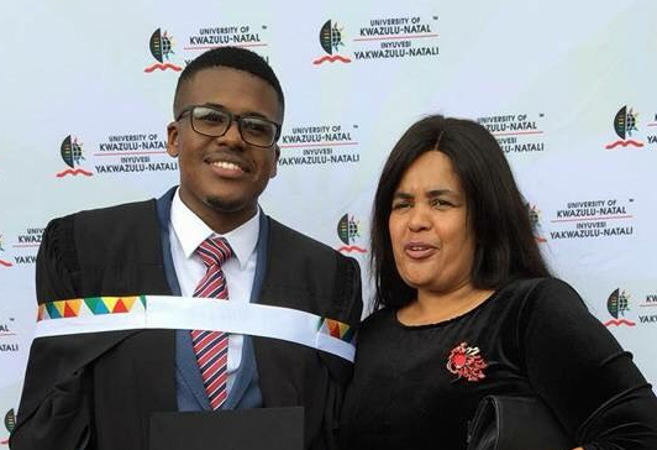 Dr Nkosinathi Shongwe, who survived a fatal motor vehicle accident, which claimed the life of his friend and colleague, Mr Tumelo Seliane – a final-year Medical student at UKZN in 2015 – has graduated. Shongwe sustained serious neurological damage in the accident and could not continue with his studies for more than a year. In 2016, another survivor of the accident, Dr Sphesihle Luvuyo Ngubane, then a Medical intern, was killed in a car crash. Shongwe said determination and a strong faith in God helped him graduate with a Bachelor of Medicine and a Bachelor of Surgery degree.